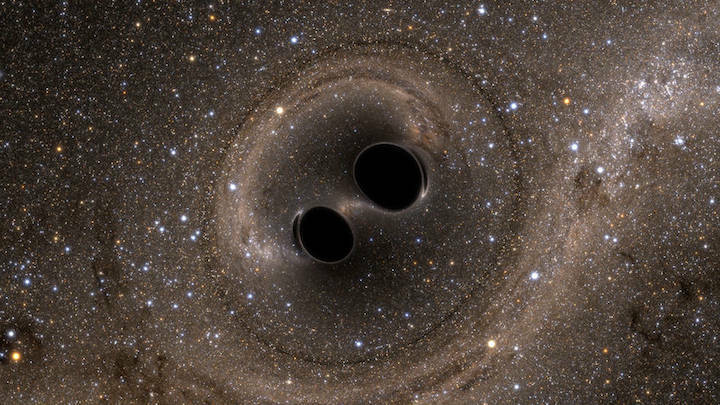 This computer simulation shows the collision of two black holes, which produces gravitational waves. Because all supermassive black holes are so distant, gravitational waves, which travel at the speed of light, take a long time to arrive at Earth. This study looked at supermassive black holes within about 700 million light-years, meaning waves from a merger between any two of them would take up to that long to be detected here by scientists. By comparison, about 650 million years ago, algae flourished and spread rapidly in Earth's oceans -- an event important to the evolution of more complex life.